From August 30 to September 1 this year, Prime Minister of Great Britain Theresa May (“accompanied by a delegation of business leaders”) was on a visit to Japan. As it was said in this regard on the British government website, during the visit and negotiations, Theresa May and her Japanese colleague Shinzo Abe, as the parties, “focussed on defense and security cooperation, as well as trade and investment opportunities“). The formal outcome of the bilateral meetings and negotiations with various participants included two Joint Declarations on Mutual Development and Security, as well as two special Joint Statements. The first Statement concerned a ‘vision’ of the situation in the world and the position of both countries in it; the second concerned the situation on the Korean peninsula. 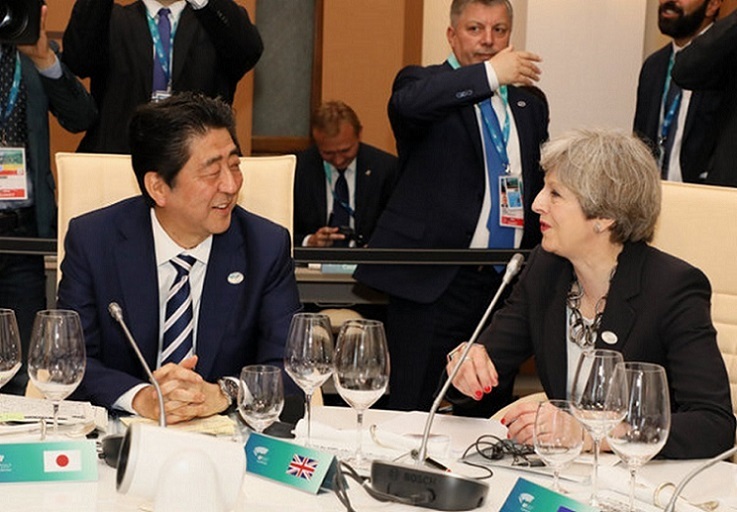 The content of these documents, together with the speeches of both Prime Ministers at the joint press conference, make it possible to say that this trip of Theresa May has become an important stage in the process of the cardinal reformatting of the situation on the table of the global political game, the main participants of which are (surely) Japan and (perhaps) Britain. This process was surreptitiously developed over the past few years, but got a sharp acceleration from the election of Donald Trump as US President. Donald Trump embarked on a mission to “revive the” (US) “economy.” The most important elements of this course included the rejection of leadership in the globalization of national economies, the introduction of protectionist measures in the sphere of foreign trade, as well as the curtailment of the two largest integration projects (Trans-Pacific and Trans-Atlantic) initiated by the previous US administration. It would seem that the exit of Britain from the EU (Brexit) is consistent with the same trend towards de-globalization and transition to protectionism. However, the ‘divorce’ of London and Brussels took on a complex and potentially very costly character (mainly for the first participant). Therefore, contrary to the popular image, in this case ‘English gentleman’ would prefer to “quietly stay” within the EU. An additional and weighty reason for this (secret) desire was the conclusion of the Economic Partnership Agreement between the EU and Japan (that is, between the third and fourth global economies), signed on July 6 this year by Shinzo Abe, on the one hand, and Jean-Claude Juncker and Donald Tusk on the other. As the official message states, it is “the most important bilateral trade agreement ever concluded by the EU.” After its full implementation, EU companies operating in Japan will save about USD 1 billion annually on the cancellation of duties. The words of Jean-Claude Juncker that the parties reject the policy of protectionism in the sphere of world economic relations also speak volumes. The New York Times, for example, noticed in this an apparent ‘anti-Tramp’ orientation of the most important Japanese-European document, which was also reportedly present in the record on the specific commitment to the Paris climate agreement in the text of the Agreement. As for Japan, being one of the main trading partners of Britain, the country is now entering a certain format of relations with the EU that it will have to take into account while further maintaining economic ties with London. Actually, the search for an answer to the question: “What’s to be done with Japan as well?” was the main goal of the “charm offensive” visit (as a British expert put it in an interview with the Chinese agency Xinhua of Theresa May to the Japanese Prime Minister. Meanwhile, there is much to worry about from London after July 6, as by now, there are 1,000 Japanese companies in Britain employing around 140,000 Britons. The accumulated volume of Japanese investments into the British economy exceeds USD 50 billion. Even after the visit of Theresa May, it has not become very clear how the British-Japanese relations in the economic sphere will develop. At the final press conference, she only pointed to the need to take into account such factors as the interim state of relations between Britain and the EU, and the new circumstances in which Japan has found itself after the conclusion of the Agreement with the EU. To find answers to the questions arising in this connection, a new joint working group shall be set up (“as soon as possible”). It is noteworthy that defense and security issues occupy the first line in the list of topics of the past Japan-Britain negotiations. Words have been pronounced (that have already become memes) on the concern over the nuclear missile demos in North Korea, as well as the necessity of “the rule of law and ensuring freedom of navigation” in the seas surrounding China. The latter, by the way, was the unspoken addressee of these symbolic words. It was precisely these aspects of defense and security that Theresa May has apparently brought as a commodity for trade with Shinzo Abe, the economic topic being the main one for her. However, this commodity hardly carried enough weight for the Japanese Prime Minister. Since December 2018, the British frigate Argill will appear in the region. However, this ship of a venerable (30-year-old) age and of a less than 5 thousand tons displacement will not as much help, as will not hinder the Japanese Navy, which nowadays exceeds the British one in terms of total displacement. The Japanese fleet (already one of the most powerful in the world) is equipped with the latest and most advanced destroyers with a displacement of up to 10 thousand tons, complete with the American missile defense system Aegis, which is absent from the ships of other US allies, including Britain. Nevertheless, the words of Theresa May on plans to send a frigate of the Royal Navy to the region deserve attention in relation to other facts. Among them are last year’s flight of 4 British Typhoon fighters to Japan, as well as the recent statement of Foreign Minister Boris Johnson on the possible participation of the newest British aircraft carrier Queen Elizabeth (currently in the stage of sea trials) in ensuring the same “freedom of navigation” in the South China Sea. Put together, these and other facts have allowed some analysts to talk about the return to the British foreign policy of the “east of Suez” region, which was excluded from the agenda at the end of the 1960s. However, in the 50 years that have passed since then, the situation in the region of the Indian and Pacific Oceans has changed dramatically. 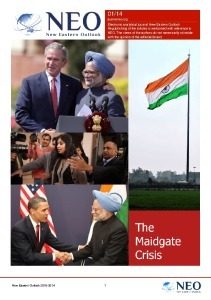 Today, Britain is unlikely to be able to expose ‘arguments’ (both economic and military and political) that are at least approaching the weight of those that are already available here for the current leading players, that is, the US, China, Japan, and even the former British colony India. The attempts of the ‘outside’ challenger (having a doubtful potential) to intervene in the game unfolding between them are fraught with serious and hardly predictable costs for the pretender. One should not, for example, overlook the fact that China is one of the main trading partners of Britain. However, the potential British allies in the region are “playing” precisely against Beijing. And in general, the following phantom-limb pains (related in this case to memories of the British empire of the times of R. Kipling) has not yet brought any good to anyone. Returning once more to the visit of Theresa May to Japan, it should be said that even for herself, reflections referring to the great past of the country that is currently headed by her have also been, most likely, nothing more than a commodity in trade with an extremely important partner in (not less important and relevant) economic issues. The near future shall demonstrate how successful this trade in Tokyo was for the British Prime Minister.